My friends at Family Support Network are fortunate to have been chosen as the beneficiary of this summer's installment of a great charity concert series, Covers for a Cause. The organizers will donate 100% of proceeds to FSN, an organization that supports families of children with special needs. Scheduled for July 31, 2013, at Charlotte's legendary Double Door Inn, the concert features some great local musicians -- Jim Avett, Mike Strauss, Bill Noonan and the Barbed Wires, Truckstop Preachers, Jim Garrett, The Loose Lugnuts, and The Turnstiles -- all performing the music of the late George Jones. 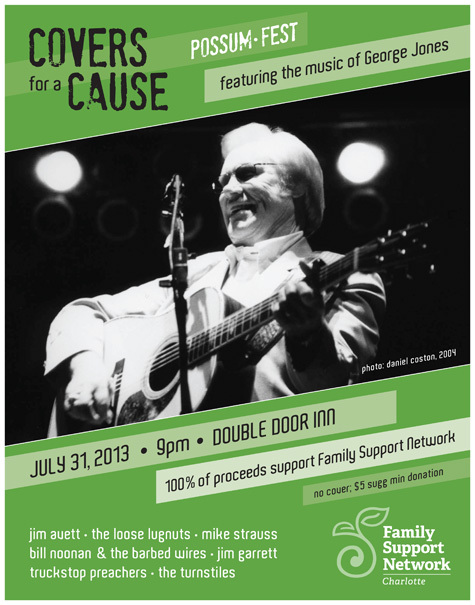 Mike Strauss, Jim Garrett and other Covers for a Cause artists will be performing on Charlotte Today on Friday, July 26, to promote the show. I was happy to volunteer to design a poster for the event -- a great fundraising opportunity for my client, and a great opportunity for the rest of us to hear some talented and generous local musicians. Everyone involved -- hosting venue, organizers, musicians, sound guys, marketers - are donating their time to this worthy cause. Thanks, Daniel Coston, for donating use of your George Jones photo.